I have a secret. 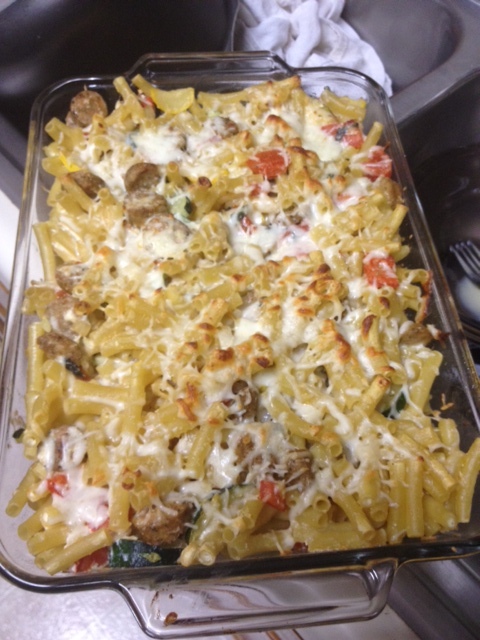 I’ve never made a non-lasagna baked pasta dish (with the exception of the kale mac & cheese I made a few weeks ago). It’s weird, actually, given how much my diet has relied on pasta over the past decade. I think it’s because that just seems like too much work—I mean, the reason I love pasta is because I can cook it quickly, toss it with any kind of sauce or veggies, and have a meal on the table in 15 minutes. Baking just seems unnecessary. 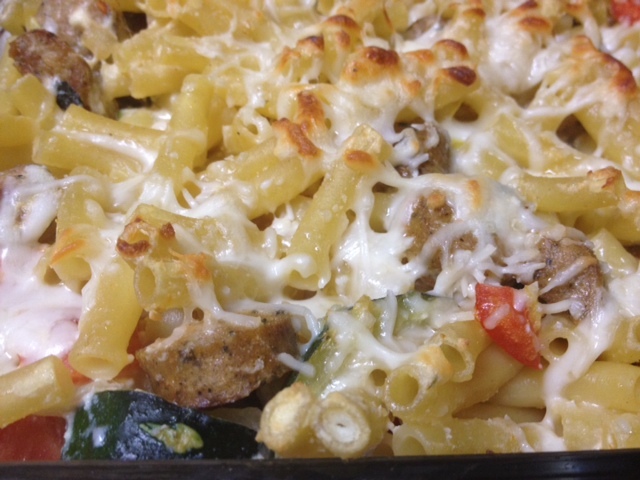 I also haven’t loved much baked pasta at restaurants…they always seem so dry. 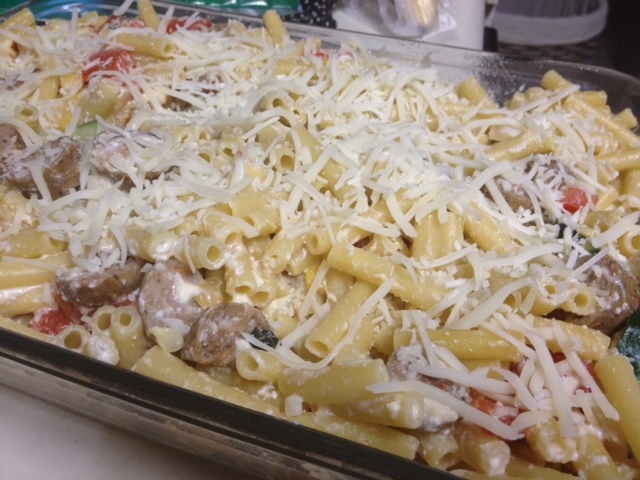 Needless to say, I approached this baked ziti recipe with some trepidation. But I was shocked by how GOOD it was! Delicious, great, bold flavors, a whole host of textures, and hearty enough to keep me feeling full for hours. 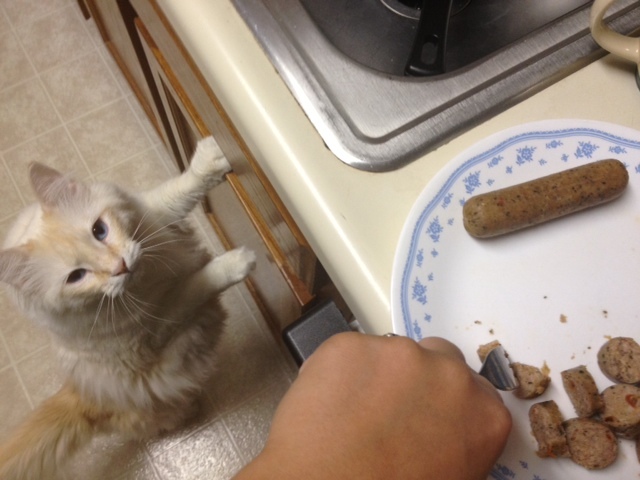 The original recipe was vegetarian, and didn’t call for the chicken sausage. But I had some on-hand and I’ve been crazily craving protein so I decided it couldn’t hurt. And it actually added an awesome flavor to everything. It’s important to note, I doubled the recipe (or thereabouts) to make a 9×13 pan, because only cooking half the package of pasta didn’t make a lot of sense to me. That way I had lots of leftovers to feed me through the work week. 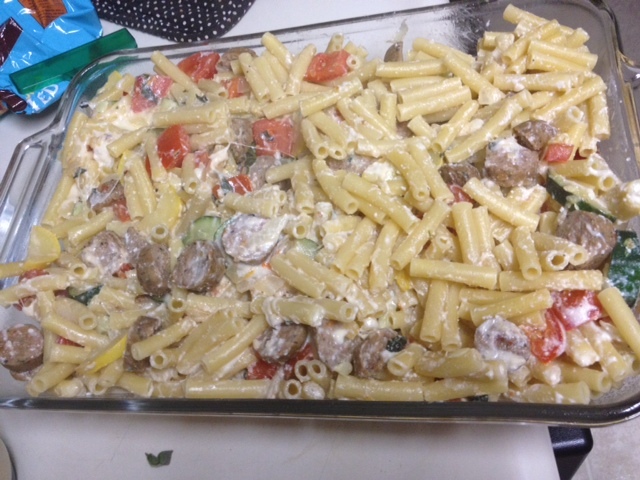 It made possibly a bit too much pasta, but otherwise worked out just fine. 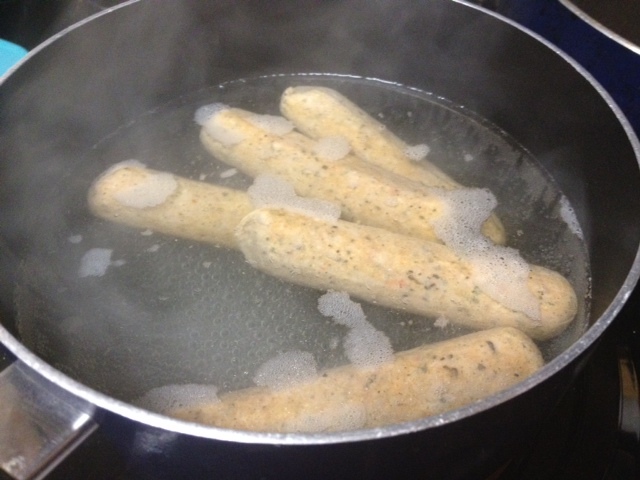 If your chicken sausage is frozen (like mine was), you’ll have to boil it to get it thawed. Then slice it up, chop it up, whatever you want to do with it. 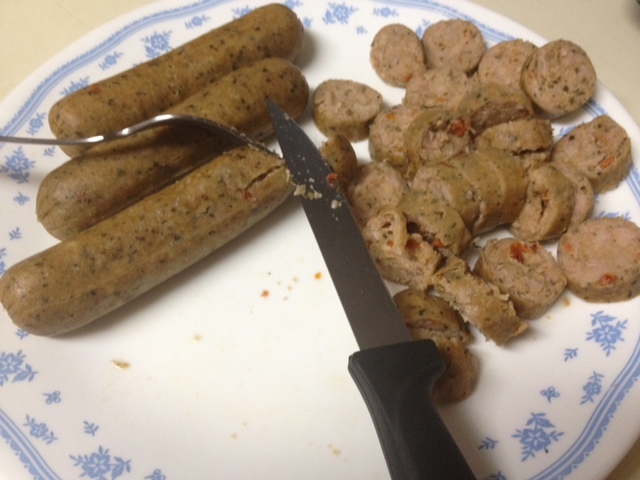 You could also use ground chicken sausage or whatever other meat you’re partial to. This handsome guy was monitoring my progress VERY closely. 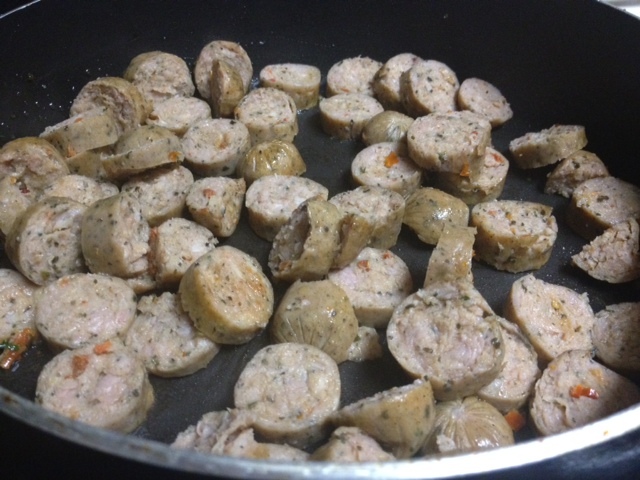 Saute the sausage in a tablespoon of olive oil just to get them nice and crisp and golden—brings out the flavor. 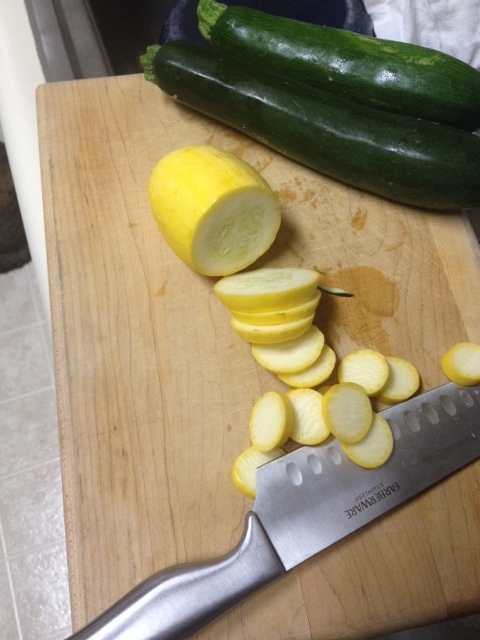 For the veggie portion of this evening’s entertainment, start by chopping up the zucchini and squash. You’ll want to make sure they’re pretty even pieces, and not too thick, so they cook evenly. 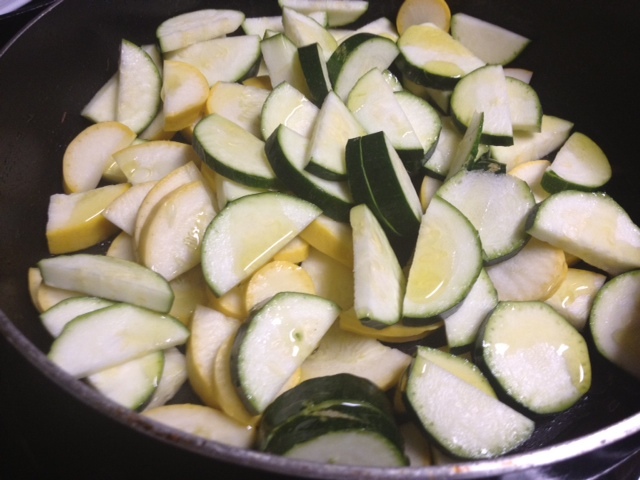 Start sauteing the zucchini and squash on medium-high in a couple tablespoons of olive oil. You’ll saute these for about 5 minutes. Chop up the onion and add as soon as possible, you want it to saute for about 5 minutes too. 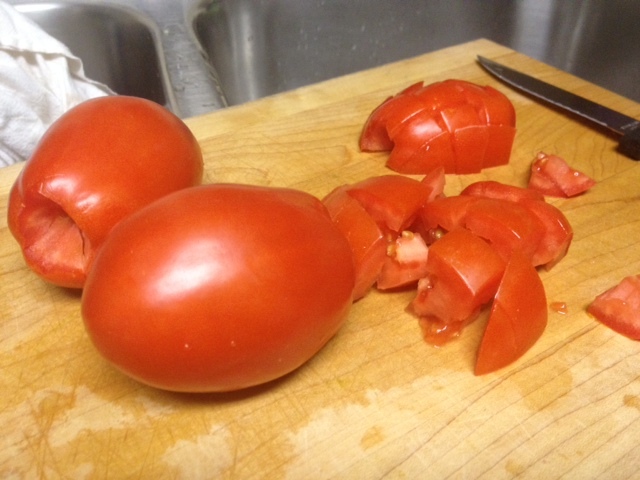 Dice the tomato, making the pieces as large or small as you’d like (even pieces aren’t as important here). Add the tomato and garlic to the pan after five minutes, and cook for another three minutes. 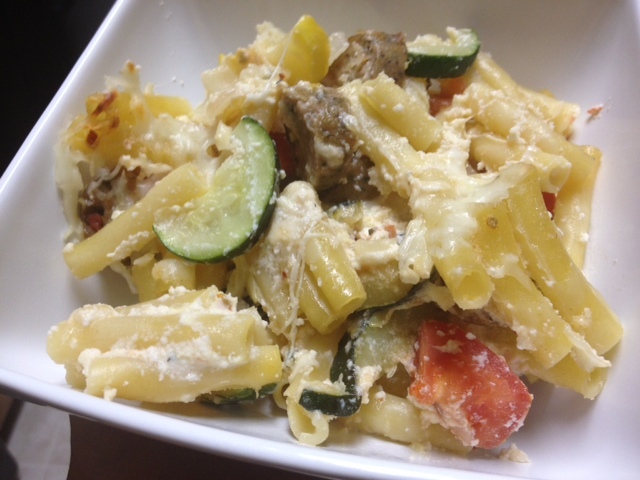 Cook the pasta according to the directions, but definitely don’t over-cook, go for al dente. Drain. 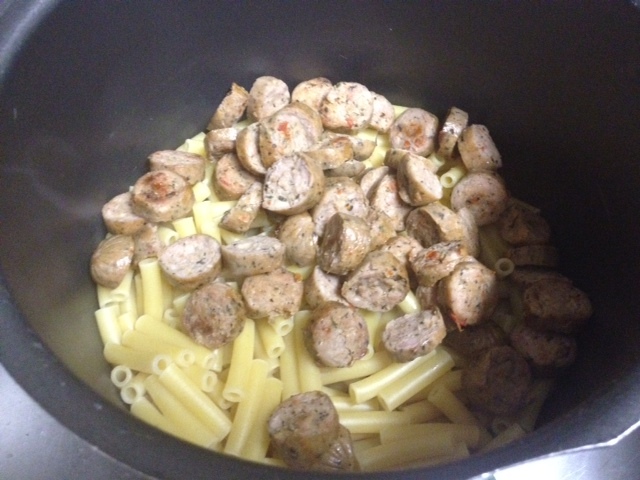 You can either combine everything in the pasta pot, or in a very large bowl. 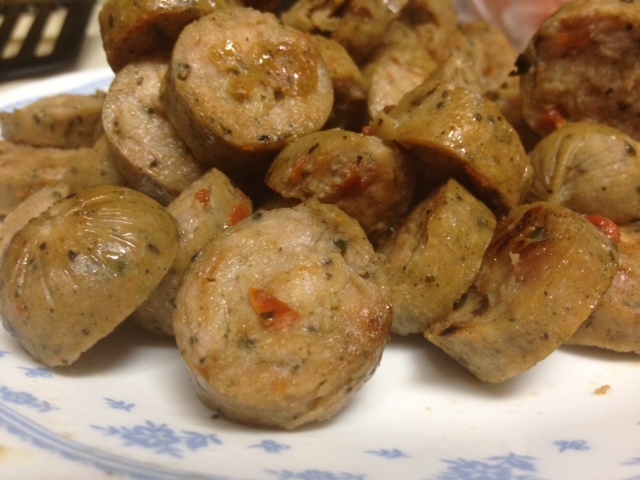 Stir in the sausage and mozzarella, as well as salt and pepper. For the sauce, you’ll combine the ricotta and egg (as well as a pinch of salt), stirring until smooth. 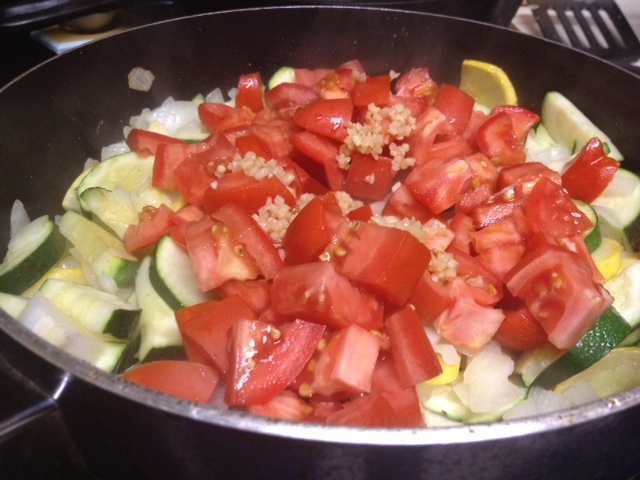 Remove the veggies from heat and then fully combine these with the sauce and the pasta/sausage/mozzarella mixture. Combine all ingredients and pour in a pan prepared with non-stick spray. This is about to get good. Sprinkle a little more cheese on top for good measure. Bake at 400 for about 15 minutes, until the cheese on top is browned. You don’t have to bake it for too long since all the ingredients are already fully cooked. I broiled for a minute at the end to get a nice browned crispness on the cheese. This makes AWESOME leftovers as well. Cook pasta according to the directions (I prefer it al dente); drain. Heat a large skillet over medium-high heat. 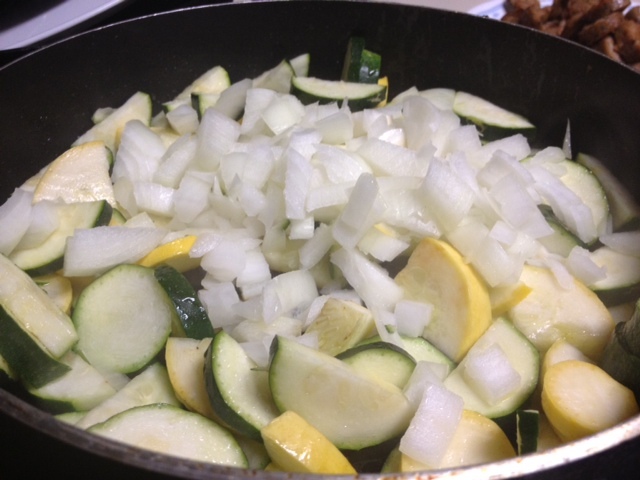 Add oil to pan, also adding squash, zucchini, and onion. Saute for 5 minutes. Add tomato and garlic, then saute 3 more minutes. 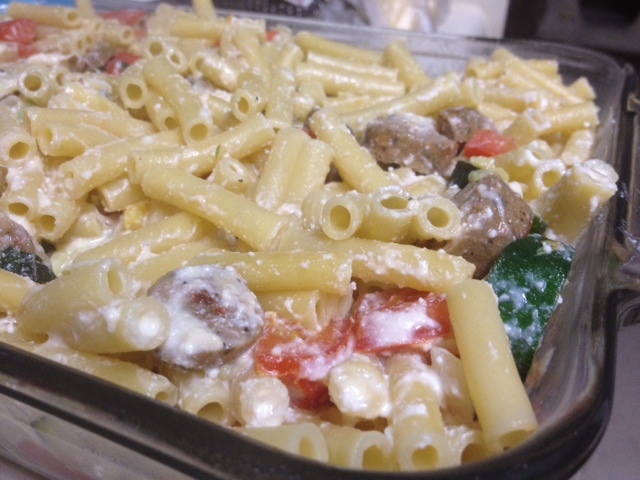 Remove from the heat, stir in pasta, 1/2 cup of mozzarella, the fresh herbs, 1/2 teaspoon salt, and pepper. 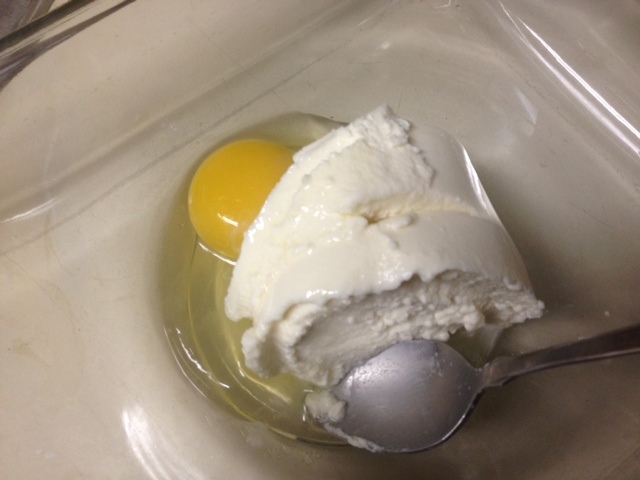 Combine ricotta, remaining salt, and egg. Stir into the pasta/veggie mixture. Spoon into an 8-inch square glass or ceramic baking dish coated with cooking spray, then sprinkle with remaining mozzarella. Bake at 400° for 15 minutes or until bubbly and browned.